As promised on twitter, I had to blog this out as the universe is just TOO amazing a place not to share this story. So I recently had a chance to present at an industry event in Las Vegas. The topic was Compliance and how our products can help you to deal with some of the burden that government, or internal governance and compliance initiatives can put on the networking staff. Now I firmly believe that configuration management is probably THE most important discipline within the network management domains. Good Configuration management can help you prevent a lot of the other issues that will creep up. I also fully accept and realize this is not exactly the sexiest or interesting material, so like any good presenter does when faced with some dry material. I tried to add in some anecdotes and metaphors to make the material a little less dry and a little more memorable. My co-presenter was giving a real-life example of a customer of ours who had two FTE employees who’s entire reason for being was to start at device #1 in the network, and manually go through the configuration to ensure it was in compliance with the various governance policies that the organization had. Now I applaud the fact that these guys at least recognized the importance of that kind of attention to detail, but I can’t imagine been the person who actually did this MANUALLY. When presented with this kind of data point, there’s of course someone in the crowd who has to question the sanity of this. In this case Lindsey Hill @northlandboy was the person who chimed in. For those of you who know Aaron, @neelixx was also in the crowd. As you can imagine, at this point, even my co-presenter is looking at me a little strange. People came to this session to hear about compliance, and I’m on some story about a Rum-Winnie. I was definitely getting a “Get to the point Chris” stare. At this point the audience laughs, my co-presenter is happy that I somehow managed to make that seem relevant and the rest of the presentation goes off without a hitch. We all pack up, say goodbye to old friends and new, and get on planes to go back to our families. Fast forward about 5 days. I’m back in Montreal and there’s a company event where engineers from our labs have been invited as a mini-tech day to talk about the new innovations, etc… that they are working from. There was a dinner invite and I’m a geek. So I just couldn’t pass up the chance to sit down and talk hard-core tech with the people who are working on the next-gen of products. I arrived a little late because of the kids karate class, and sit down at the free chairs and start chatting with the people. One of them recognizes the new shirt and asked me what I was presenting on in Vegas. Now it’s not every day that you can bring Rum-Winnie into a technical presentation and somehow make it relevant to the overall content, and this just happened, so I’m happy to share the story. C’Mon it’s Rum-Winnie!!!! How could I NOT share this story. This is where it gets really cool. Everyone laughs at the story, but the guy sitting across from me starts gets a little twinkle in his eye and starts reaching for his phone. 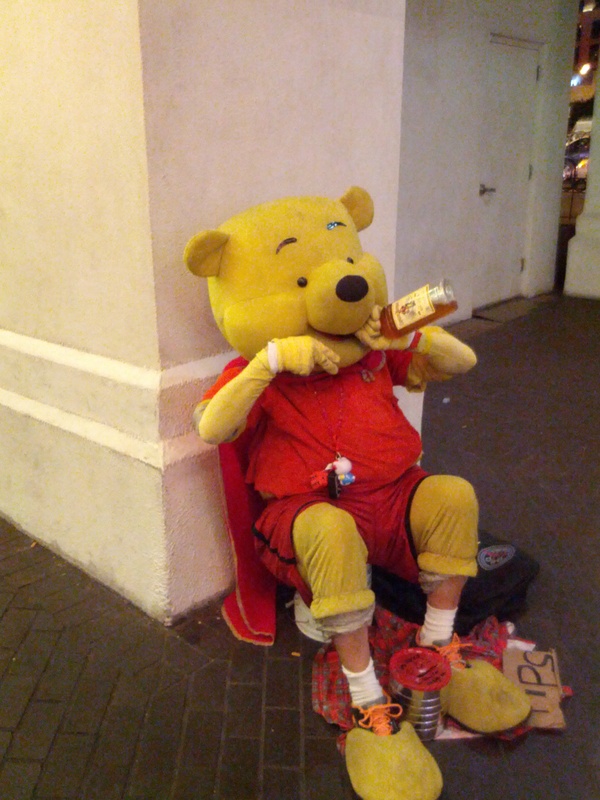 Turns out this mostly random guy from Austin, Texas that I met at a Jack Astor’s in Montreal who HAPPENED to be in Vegas at the same time that I was who HAPPENED to be out walking the Vegas strip chose to take a picture of the Rum-Pooh that I had randomly decided to use as an example in my presentation! How freaken cool is the universe we live in?